Coming right up is the 2016 OcraFolk Festival, this weekend, June 3-5. 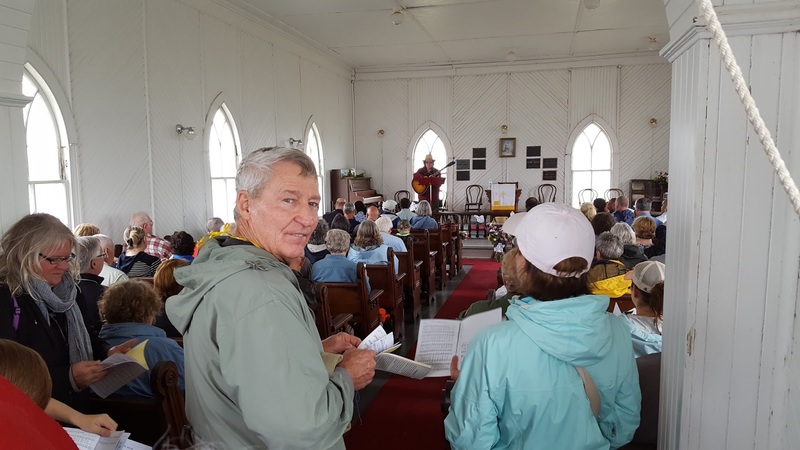 Visit Ocracoke Alive's Web Site for the schedule of events, up-to-date information about this year's musicians & storytellers, the Friday evening art auction, Saturday night's traditional Ocracoke square dance, special concerts, and the Admiralty Dock Party. A host of activities, fabulous music, outstanding arts & crafts, and great island food combine to make this one of the island's most popular events. We hope to see you this weekend. 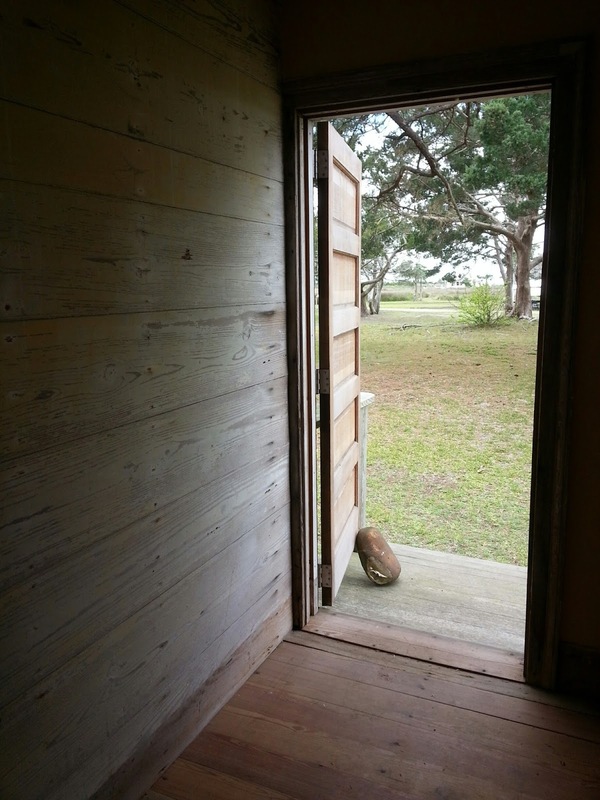 Every year the Ocracoke Festival (June 3-5 this year) hosts an art auction. The on-site live auction will take place this coming Friday, June 3rd, at the Berkley Manor starting at 7:00 pm. For those who want to get a jump start on bidding (or who can't make it to the event), Festival organizers are offering online bidding until 7 PM, Thursday, June 2. The highest online bid will become the starting bid for the on-site auction on Friday, June 3rd. If no one outbids you, you are the winner! For photos of the art, an on-line bidding form, and more information, please visit the official Ocracoke Festival web site: http://www.ocracokealive.org/auction.html. Ocracoke has never had a shortage of wonderful island characters. Some that come to mind are Rob Hanks (who, in the 1950s, would tell you the story of Ocracoke for a dime), Wilbur Gaskill (who carved birds and entertained visitors with crazy hand gestures), Horatio Williams (who sank his schooner during the Civil War to keep it out of the hands of both the North & the South), Bill Askren (a hippy before there were hippies), and Mad Mag Howard (who liked to stand in graveyards after dark). I also think of Henry (with the 3-lgged dog), Don Wood (whose living room also served as his workshop), and Dale (he works sometimes at Village Craftsmen!). Susan's house is full of creative things: colorful quilts of her own design, numerous animal bones and skulls, elaborate crucifixes and statues...and baby doll heads. "You know, Susan," I said to her, "you are a wonderful person, full of love and compassion, smart, and incredibly talented and creative. But those baby doll heads are kind of weird." "Philip, you would be surprised to know how many people collect baby doll heads," she replied. With nothing more to be said, we then proceeded to enjoy our walk on the beach. Just another Ocracoke Island Character! One of the cutest critters is the rabbit. 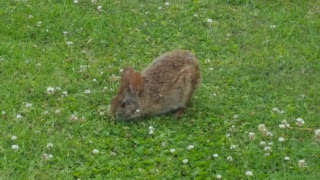 They are seen most frequently in the early morning hours nibbling in the mowed grass beside NC 12. 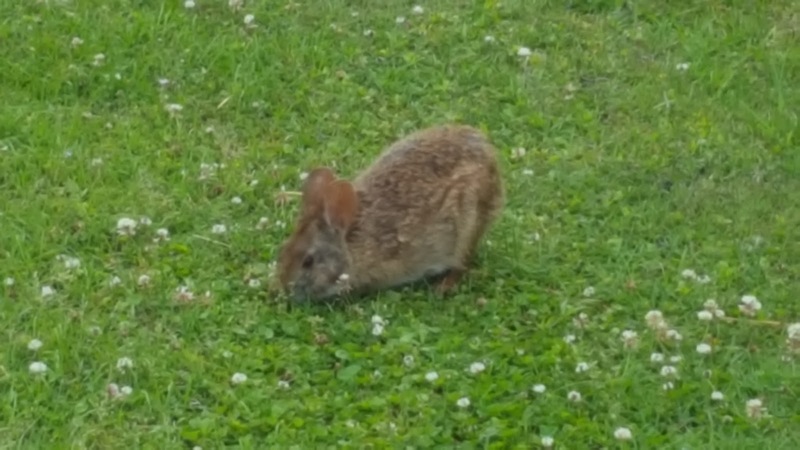 I believe this is a marsh rabbit. I took the photo a few days ago. He/she didn't seem frightened until I approached within a couple of feet. "We hear that the charges against Rev. 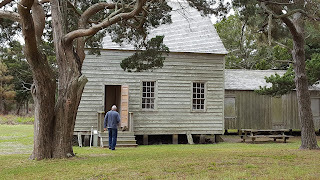 Mr. West, the Northern Methodist pastor at Ocracoke, have been investigated and that he has been acquitted." You might wonder what the charges were. Read on. In June 1894, Mr. West was investigated by church officials on the charge of drunkenness, but, as the article above attests, was acquitted. One can only wonder what was going on behind the scenes! 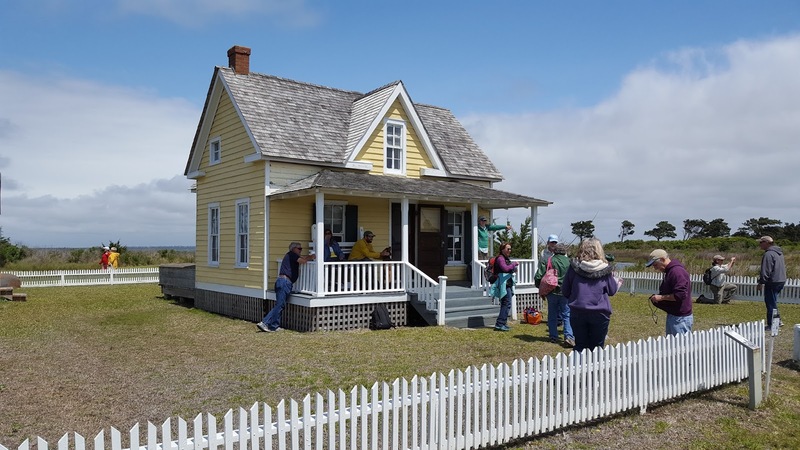 Thanks, in part, to a grant from the Ocracoke Occupancy Tax Board to the Ocracoke Preservation Society nine scrapbooks in the Society's collection have now been digitized and added to DigitalNC. 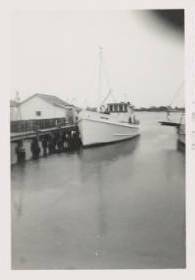 These scrapbooks range from the 1940s to the 1980s and include photographs, newspaper clippings, brochures, booklets, drawings, letters, maps, short stories, and histories about Ocracoke. The newspaper articles are often about local people and families, events, and news such as park projects and ferries. The brochures and booklets are typically informational, about nature, animals, boats, and lighthouses on the Outer Banks and Ocracoke Island . The 1955-1981 scrapbook in particular features information about lighthouses and lighthouse keepers and ships and sailors. 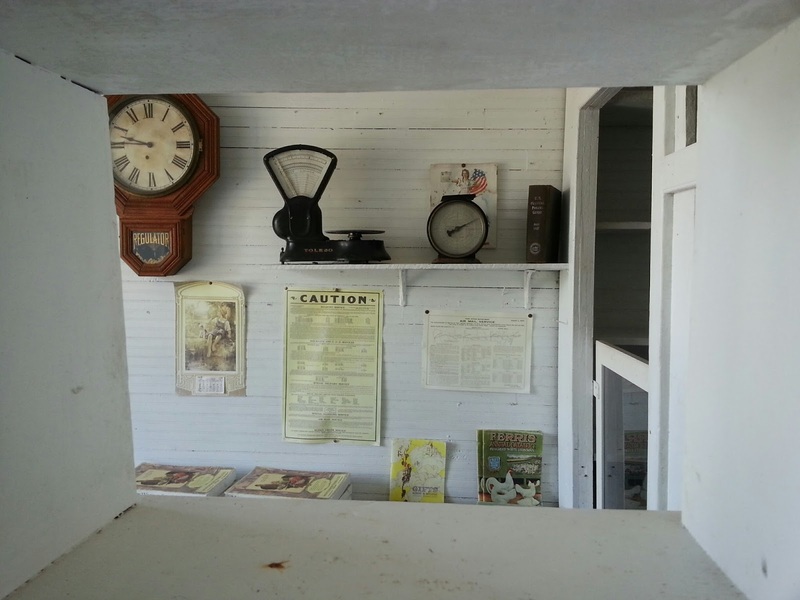 The 1956-1980 scrapbook is full of photographs from Ocracoke, including buildings, houses, ships, and the lighthouse. These scrapbooks contain a wealth of historic information that was once difficult to access, but is now available to residents, visitors, and researchers from their laptops or other devices. We hope you enjoy perusing these on-line scrapbooks. I will periodically share specific stories, photos, and other documents in future blog posts. In 1899 a massive hurricane struck the Outer Banks. The barkentine Priscilla was one of many ships wrecked in August of that year. In 1903 Pearson's Magazine published "A History of the United States Life-Saving Service" by Theodore Waters. 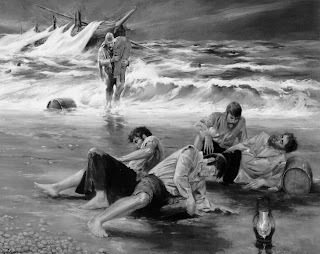 In the article Waters relates the dramatic story of lifesaver, Rasmus Midgett, and his rescue of the crew of the Priscilla. 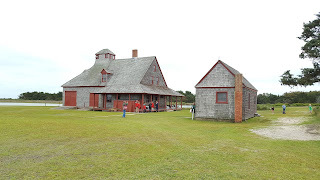 I have re-published the article as our current Ocracoke Newsletter. 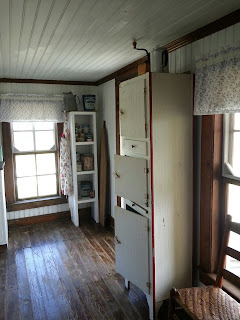 You can read it here: http://www.villagecraftsmen.com/news052116.htm. My son, Stefen, has been working diligently on his Ocracoke Navigator mobile web app. 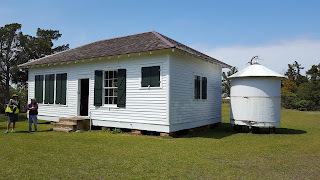 In addition to including over two hundred interactive maps, extensive historical content, vintage and contemporary photographs, and other information about Ocracoke Island, Stefen has added a new and exciting feature...photospheres, 360 degree spherical photographs, like those found in Google Street View, that offer an immersive viewing experience. Click on the photo below to view a fascinating 360 degree photo of the interior of the Ocracoke Lighthouse, just one of many photospheres on OcracokeNavigator. 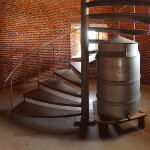 You can use your mouse to vary the speed of rotation, and to peer up into the top of the tower. To date, Stefen has published 20 photospheres of Ocracoke cultural heritage sites, cemeteries, natural areas, and historic buildings. Follow this link for more information: https://www.ocracokenavigator.com/photo-sphere-map/. This month's Ocracoke Newsletter is Allie (Teenie) Scott's 1968 story of Simon Garrish, Jr. and the US Life-Saving horse, Sambo. You can read it by clicking here: www.villagecraftsmen.com/news042116.htm. The last several days' posts brought back another memory from my neighbor, Al Scarborough. In 1962 he and his friend, Billy Ely, went to the movies at the Wahab Village Theater. The film showing was Sunrise at Campobello the story of Franklin Roosevelt's bout with polio at age 40 in 1921 and how his family (and especially his wife Eleanor) coped with his illness. As they were watching the movie, the power suddenly went out, a frequent occurrence on Ocracoke at the time. Everyone received a refund, and returned home. In 1989, 27 years later, Billy told Al, "Remember that movie about Roosevelt we watched in 1962 when the power went out? Well, it was playing on TV the other night. I finally saw the end of the movie!" "Philip, you bring back great memories of going to the movies on Ocracoke on hot summer nights. The windows were open to catch any breeze that passed by, but there were no screens. This meant lots of mosquitoes. 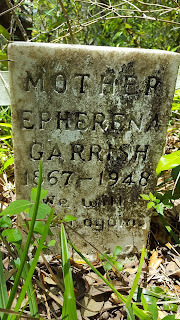 The solution to both the heat and the mosquitoes was to use one of those old-time paddle-shaped fans, cardboard on a wooden handle, advertising some funeral home on the mainland. That was nightlife on Ocracoke." Bobby's comment reminded me of one night at the Wahab Village theater. 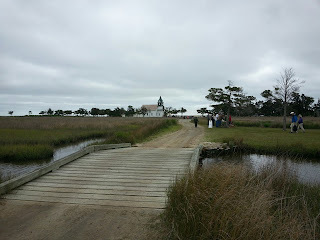 Ocracoke never received current movies; they were always months, or even years, old, but we enjoyed them nevertheless. Also, the theater had only one projector [see my comment at 10:43 for a correction]. Since feature length movies came on multiple reels, that meant having an intermission while the projectionist changed reels. On that particular night we were watching a science fiction movie. During the intermission we bought candy and soft drinks, and waited impatiently to find out what would transpire next. When the lights went out and we looked up at the screen we saw cowboys on horseback thundering across the prairie. You should have heard the uproar from the teenagers! We all got our quarters back, but we were not happy. 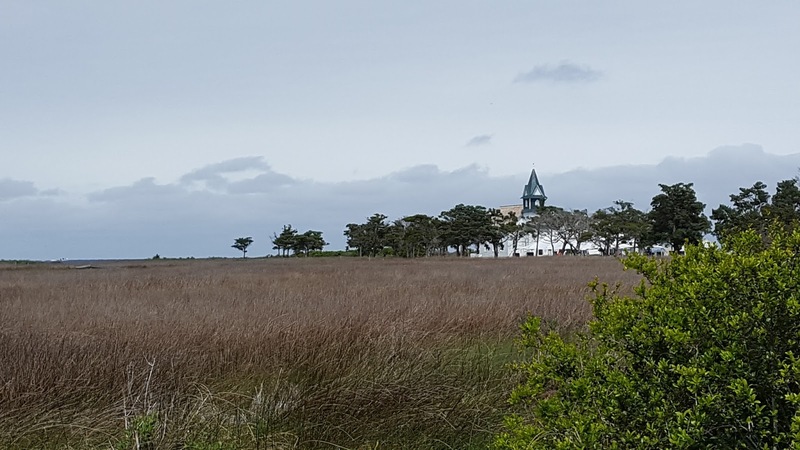 Ocracoke Island has a well-deserved reputation as a quiet place of refuge, a tranquil and serene respite from the worst aspects of the outside world. But every once in a while, evil intrudes into our insular lives. One of the worst occurred on April 26, 1987. On that date the body of a man who had been shot and stuffed into a canvas bag was found washed up on the sound side of the island. The canvas bag had cinder blocks tied to it. To my knowledge, the man's identity was never determined. The crime had all of the earmarks of a drug deal gone bad, and the state of the body and canvas bag suggested the murder had occurred quite a distance away, probably somewhere in the Caribbean. Although Ocracoke is in many ways an oasis of peace and tranquility, events like this occasionally shock us with their brutality. The good news is that this horrible crime happened more than 30 years ago, and far away. Even in the 21st century Ocracoke still offers a respite from the cares of the world. "The moving picture theatre, which occupies the southern wing of the Wahab Village Hotel, isn't making anyone rich. Shows are run on Tuesday and Saturday nights. Admission is 40 cents for adults, 25 cents for children. Seating capacity is around 250. 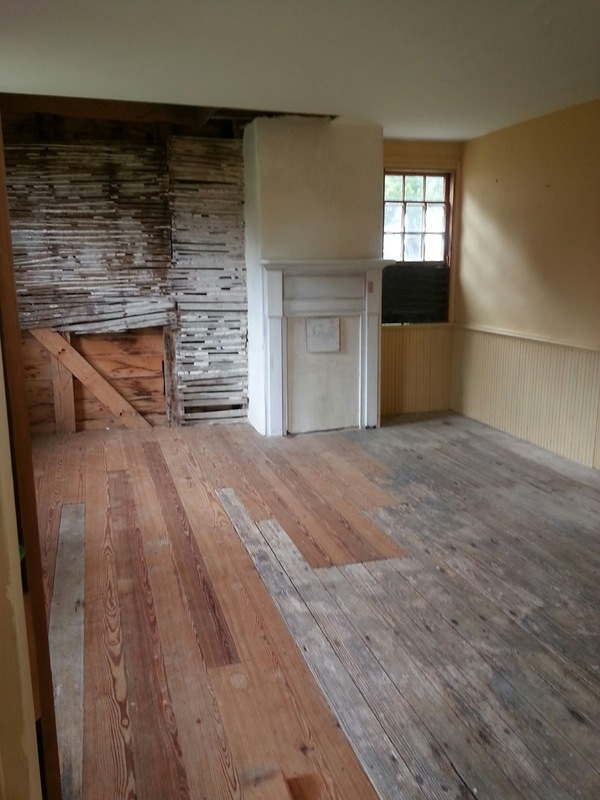 There's nothing fancy about interior decorations. "The film costs $16.50. Then there's the cost of postage, wages for a machine operator, lights and power, etc. [C.F.] Boyette [the manager of the hotel] figures that the total cost involved in producing one show is $30. "Now then, let's see. Take 40 adults at 40 cents ($16.00) and 60 children at 25 cents ($15.00) and you have only $31.00 in revenue. That's about the average attendance." Seven years ago I published this story that illustrates Ocracoke humor, but think it is worth sharing again. I hope you enjoy it. 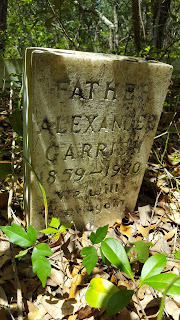 Years ago there were three Ocracoke men who were very good friends, two brothers and another man. They played poker often, and their get-togethers always involved a large jug of homemade meal wine . Eventually one of them “got religion" and renounced strong drink. He convinced his brother and their friend to join him at a revival. At the church he got testifying, and claimed to have given “his heart to the Lord.” He shouted out that “Jesus is coming" and proclaimed in a loud voice that he was ready, no matter how the Lord chose to make his appearance. 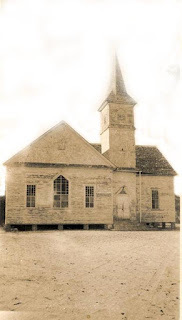 To emphasize his preparedness he bellowed out that he had “one foot on water, one foot on land, and one foot in the sea.” They say his brother got so tickled, he had to crawl out of the church. The fall, 1979, issue of Sea Chest, a non-profit, educational project of the students of Cape Hatteras School, included Caroline Smith's interview with Portsmouth Island native Steve Roberts (b. 1901). He related his memories of young people's entertainment. "The captain of the Coast Guard Station was a good man and he'd let the man who handled the horses take the wagon -- it would take about 35 of us to take it across the beach to the strand -- and we would have a nice time, just singing and riding. Especially if the moon was full. It was pretty with the moon shining on the ocean." 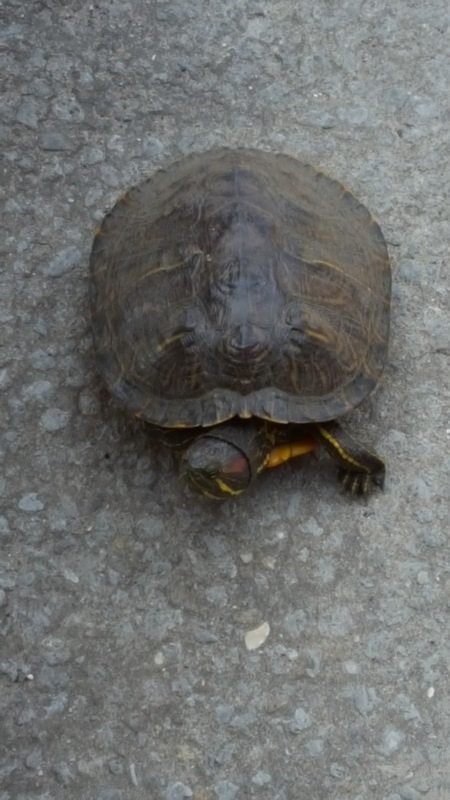 I encountered this medium-sized turtle (I am guessing it was about 8" long) wandering around the parking area at the gas station several days ago. It was headed away from the highway, so I guessed it was safe for the moment. Another person was there looking after him/her. 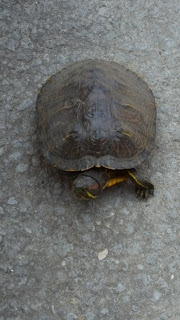 After doing a little research I am guessing this was a Yellow Bellied Slider. Any experts out there who want to weigh in? Here is information from Wikipedia: https://en.wikipedia.org/wiki/Yellow-bellied_slider. 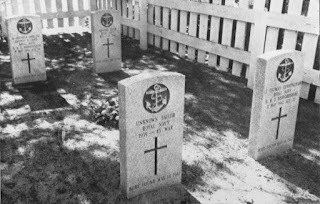 At 11:40 pm on this date, 1942, in the ocean off the coast of Ocracoke, the German submarine, U-558, sent a torpedo into the side of the British armed trawler, HMT Bedfordshire, killing all hands. 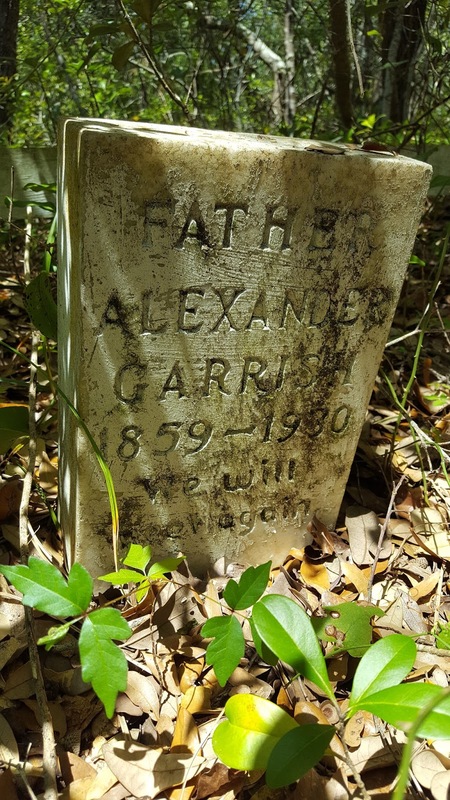 On the morning of May 14 two Coast Guardsmen from the Ocracoke station patrolling the beach discovered a body washed up in the surf. At about the same time a civilian discovered a second body near the inlet. Some time later another two bodies washed up on Ocracoke. It was presumed that all four men were sailors from the Bedfordshire. These British sailors were laid to rest in Ocracoke village, in what is now known as the British Cemetery. Portsmouth Village never fails to intrigue me. 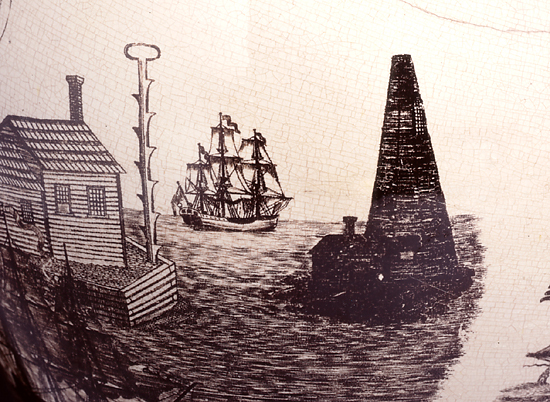 It was a lightering port established in 1753 by the North Carolina Colonial Assembly. Cargo from sailing ships bound to mainland ports was unloaded there and transferred to lighter, shallower draft vessels that were able to navigate the waters of Pamlico Sound. 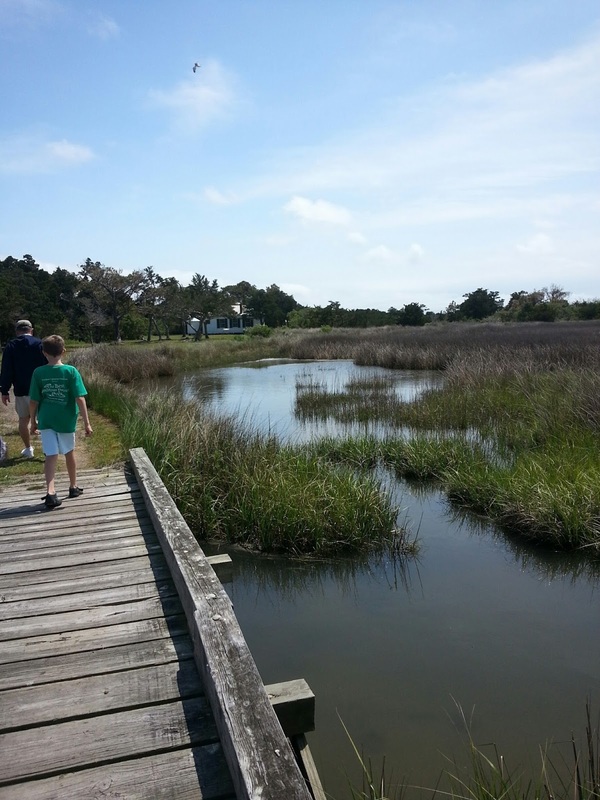 In the middle of the 19th century as many as 1,400 ships passed through Ocracoke Inlet, and Portsmouth was at its apex. Six hundred and eighty-five people called Portsmouth home in 1860. But soon the Civil War disrupted shipping along the east coast, and in time railroads replaced sailing vessels for transporting goods. Hurricanes in 1899, 1933, and 1944 dealt severe blows to a declining population. The last two residents left the island in 1971. 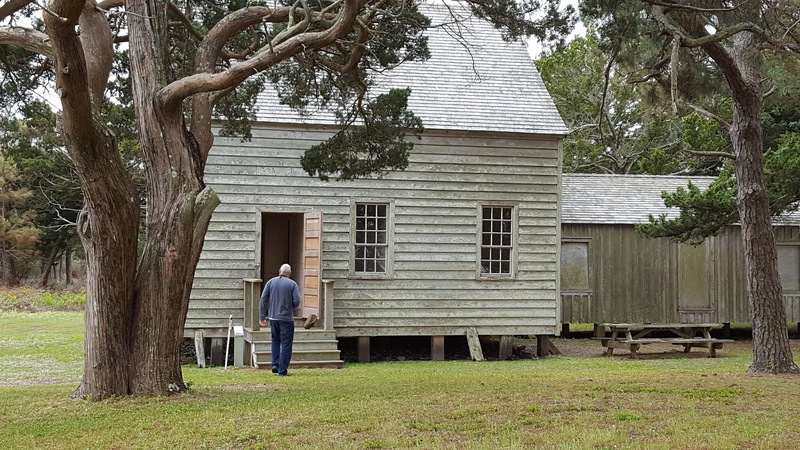 Today only the Methodist Church, the Post Office, the Schoolhouse, the Life-Saving Station, several cemeteries, and a handful of homes remain, all cared for by the National Park Service. Below are several photos taken by Jim Fineman of Manteo during the recent Portsmouth Island Homecoming. On Saturday Amy sent me a link about two Pakistani brothers who are normal active children during the day, but once the sun goes down, they both lapse into a vegetative state -- unable to move or talk. 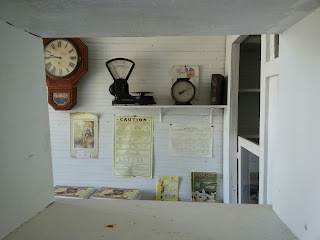 If you missed these posts you might want to read them; if you have already read them you might want to read them again. They are quite interesting. 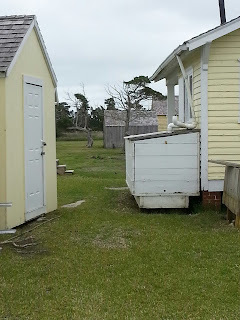 A few days ago Ocracoke property owner, John Runyon, sent me a link to a February, 2016, TED talk by Alice Rawsthorn. I thought our readers might enjoy hearing her take on Blackbeard's career as a designer. Not long ago, as I was visiting with friends, my eleven year old grandson, Lachlan, stopped by with an impish grin on his face. He came to recite a limerick he had composed. When he was finished we all cracked up. Who loved to sit down on the throne. He said, "What's the rush?" "I'm playing my built-in trombone!" In 1789 John Gray Blount and John Wallace obtained five islands between Ocracoke and Portsmouth. The most prominent island was dubbed Shell Castle Rock. 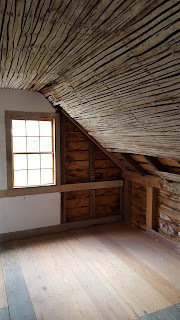 Wallace and Blount established a piloting and lightering enterprise there that eventually included warehouses, a grist mill, a windmill, a store, a fishery, two residences, and a wooden lighthouse. Wallace was given the title "Governor of Shell Castle." Your boast, your glory's in the dreary grave. The sweet asylum from th' Atlantic wave. To heaven's high mansion has its journey sped. Misfortune's sons will view his like no more. Several evenings ago I hosted a family dinner. Someone told a story about a missed opportunity (I can't remember the details). Without prompting, my eleven-year-old grandson, Lachlan, said, "Too late, I've done promised Freener!" My cousin, Lee, who was visiting from Virginia, looked at me with a quizzical eye. 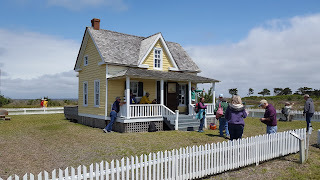 It was an opportunity to share another Ocracoke Island story. Shortly thereafter the first young woman decided she would accept Alexander's proposal. "Too late," Alexander said, "I’ve done promised Freener." Just a few photos from Saturday's Portsmouth Island Homecoming celebration. Several hundred people attended, including many descendants of historic Portsmouth Island families. And the island was blessedly free of mosquitoes!